great stuff, how long will sites be up and running? John, the web site and PMP pages will remain as permanent resources. but my question is PM always analyses first and never jumps in to solution/corrective action first so how a PM can jump in to root cause correction without analyzing first. Always could you explain more difference between BEST vs NEXT vs FIRST vs MOST with examples if possible. These are great questions. First, be careful with phrases like, “PM always …and never …”. I believe that approach can trip you up on projects and on the exam. In fact, some practice test questions use wording specifically to try to get you to respond based on a dependable PMI principle. But the real goal of the question is to make you think and answer based on the situation. You are correct that a PM would not just jump in, but sometimes communication or action is required early and an exhaustive solution comes afterward. FIRST or NEXT are equivalent in terms of situational questions and usually involve the sequencing and in which a PM plans or acts. BEST generally involves root cause analysis to determine the complete solution. MOST usually refers to the multiple correct answers offered, directing you to choose the MOST appropriate response. of the inventory and could cause dangerous results. Liftoff is in 30 minutes. What should you do FIRST? 1) This a technical issue. Rely on your engineers to make the appropriate correction. 2) Audit your quality control process to determine why untested fuel was delivered. 3) Submit a change request to correct the fueling process and prevent this mistake from happening again. 4) Call mission control and tell them to stop the fuel delivery. The answer is #4. Sure, investigating how this happened and preventing it in the future is critical. But that does not help the people sitting in the rocket. Sometimes the question is asking about safety, ethics, or immediacy and not about doing thorough analysis. These questions often ask what should be done NEXT or FIRST. Feel free to post wherever helpful. If you include the link to this page, it will allow the discussions to continue. I agree #13 is vague. The point I intended was when handling professionalism issues, a PMP should generally defer to direct and candid communication with those you have a responsibility to. For example if a project is far behind schedule, should you notify the sponsor, update the schedule, reduce the scope, or try to make up the time by crashing the project? The answer is to tell the sponsor, even though you may do some of the others as well. It is the same for situations where employees are unprepared for meetings, product quality standards are not being met, financial improprieties are discovered, etc. Whereas in other areas of PM, you may look for creative solutions to fix problems, in ethics and professionalism situations, you should generally choose to communicate the critical information to the people who need to hear it. Hi Mark, I am kind of doubtful about “Do the change” refers to writing up the change request, not implementing it. Can you explain about it more? The phrase “Do the change” almost looks like they are asking to implement the change….. I think you are exactly right about this phrase. I was dubious too and I still am. I received this information directly from my PMI preparation course instructor and I even later asked him, “Where is this referenced?” His answer was that not everything is documented. Hmmm. I tried looking it up again but the #1 Google hit is this page. So this enough for me to note above, Wikipedia-style, that this assertion is unsubstantiated and requires citation. However, please note a couple items that are true about this test tip. There is a point PMI makes about the role of the PM in managing change and the phases of that change process. He may discuss, write up, submit it to the change control board, and update the project documentation of many requests during project execution. There are PM responsibilities surrounding that phase of the change process, none of which refer to the actual implementation of the change. I think this is the distinction my instructor intended to detail with ‘do the change’. From an exam strategy, it’s important to keep in mind that these activities do not constitute any level of approval, outside the PM team. I have seen practice questions that cover things like, “Should we get started on a change right away?” or “Since this change affects only our group, does it need to go through the formal process?”. For these questions, the strategy is to consider the changes as unapproved and not to be implemented until they are. Thanks for the heads-up Rangarajan! I took the PMP exam today and did not pass. I know the 42 processes, the component of the PM Plan and all of the earned value formulas. I read the PMBOK and Andy Crowe’s book two times. I also took some practice exams, so can you tell me what I did wrong. I’m told the pass rate is low so it’s fairly common to need more than one try. Unfortunately there is no one area that I can recommend improving. You should have received a report of how you scored for each area, which may help you focus your next effort. The items at the top of this page are a pretty good cross section of things to focus on. Most instructors will tell you though that it requires in depth, working knowledge of all areas. I tend to agree. Just knowing the processes, or the ITTOs, or a number of areas is not sufficient. You really need to immerse yourself in the content to have comfort level with all the different types of information needed. Check out all the PMP pages on this site and on others. The information is not comprehensive, but it is a pretty good bet that if you have solid understanding of all the topics here, you are doing well. Another way to gauge your readiness is to use the tests in the exam prep books like: http://www.amazon.com/PMP-Exam-Prep-Sixth-Passing/dp/1932735186/ I found those tests very difficult and and an essential part of the prep process. I took them repeatedly and did not sit for the exam until I was passing those tests regularly. Don’t mark the answers in the book either. 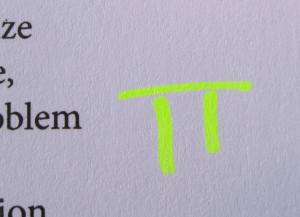 Mark them on a separate post-it note, so you can test again without hints to the answers. For any questions that you miss or even those that you had to guess at, note these and go back to that section in the chapter and review it so you are better prepped next time. I studied every day for about 2 months before testing for the exam. It’s definitely a tough exam, but mostly because of the volume of information on it, not the difficulty of the content. I wanted to follow up on the email I sent a few days ago; I took my PMP exam this afternoon and passed! It was a huge relief when the Congratulations on passing the PMP exam flashed up on the screen. I don’t think it’s letting out any secrets to say that I spent a lot of time typing in the answers to the empty cells on everything above over and over and over. It really helped to cement the knowledge, plus my ability to write out as much of it as I could on the scratch paper made it less stressful than trying to remember it during the test. When I got to the exam, I wrote everything down during the 15 minute computer tutorial, it was so ingrained by the practicing that it was automatic; and it REALLY made a difference. I have a small tidbit to add to your material that helped me. Memorizing the 5 process groups wasn’t too hard, but learning “I Saw Two Chicagoans Quietly Having Coffee Reading Poetry” helped me nail the 9 process areas. Learning the “phone number” 965-633-4564 helped me to memorize the processes; there are 9 process groups and the rest of the phone number says how many processes are in each area (6 in Integration, 5 in Scope, 6 in Time, etc) When I first saw the material, I didn’t think I’d be able to get these memorized, but a few tricks and a lot of rote memory really work. I’m sure you’ve long-since moved your focus past PMI studying. Sorry for the late reply but I no longer regularly monitor this page’s comments. Ron (and anyone), feel free to use the PMP tips I posted here in any way you like. Katie, thanks very much for posting your suggestions! It makes these pages and our community stronger when everyone helps. Thanks Ron, the website at http://sites.google.com/site/pgmpguide was really useful. there aren’t too many free sites with tips and Q&A, and the questions did come in handy. Appreciate it! Thank you so much for this. It was very helpful during my exam preparation!